(Nanowerk News) University of Tokyo researchers have developed an ultrathin, ultraflexible, protective layer and demonstrated its use by creating an air-stable, organic light-emitting diode (OLED) display. 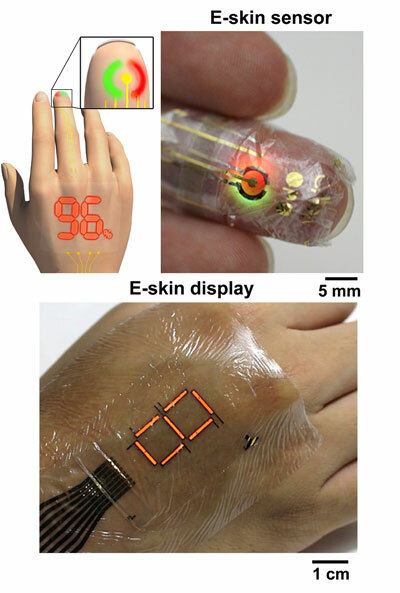 This technology will enable creation of electronic skin (e-skin) displays of blood oxygen level, e-skin heart rate sensors for athletes and many other applications (Science Advances, "Ultraflexible organic photonic skin"). Integrating electronic devices with the human body to enhance or restore body function for biomedical applications is the goal of researchers around the world. In particular, wearable electronics need to be thin and flexible to minimize impact where they attach to the body. However, most devices developed so far have required millimeter-scale thickness glass or plastic substrates with limited flexibility, while micrometer-scale thin flexible organic devices have not been stable enough to survive in air. The research group of Professor Takao Someya and Dr. Tomoyuki Yokota at the University of Tokyo’s Graduate School of Engineering has developed a high-quality protective film less than two micrometers thick that enables the production of ultrathin, ultraflexible, high performance wearable electronic displays and other devices. The group developed the protective film by alternating layers of inorganic (Silicon Oxynitrite) and organic (Parylene) material. The protective film prevented passage of oxygen and water vapor in the air, extending device lifetimes from the few hours seen in prior research to several days. In addition, the research group were able to attach transparent indium tin oxide (ITO) electrodes to an ultrathin substrate without damaging it, making the e-skin display possible. Using the new protective layer and ITO electrodes, the research group created polymer light-emitting diodes (PLEDs) and organic photodetectors (OPDs). These were thin enough to be attached to the skin and flexible enough to distort and crumple in response to body movement. The PLEDs were just three micrometers thick and over six times more efficient than previously reported ultrathin PLEDs. This reduced heat generation and power consumption, making them particularly suitable for direct attachment to the body for medical applications such as displays for blood oxygen concentration or pulse rate. The research group also combined red and green PLEDs with a photodetector to demonstrate a blood oxygen sensor.